Antonina Dashkina, President of Russian Union of Social Workers and Social Pedagogues, Vice President of INGO Conference, Council of Europe. We explore social work in Russia and the differences between Russia and the UK – most notably Russians view social work with a glass half full attitude rather than the negative attitude the UK appears to have of our profession. Antonina has an incredible wealth of knowledge and provides a fascinating insight into international social work. We touch on the political situation between Russia and Ukraine and she explains to us the impacts on Russian social work and her talks with her Ukrainian equivalent. 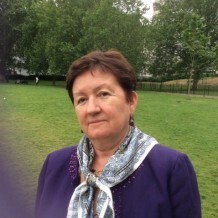 Antonina obtained a degree in English at the Moscow State Pedagogical University, became a community worker in the 1980s and subsequently a Doctor of Social Work. She worked in the faculty of Pedagogical Sciences and became a lecturer on international social services at Moscow Pedagogical University. She has wide international experience and has worked on programmes administered from the UK since 1992. She co-founded the Russian European Trust in 1993. Secondly I was interviewed on BBC Points West regarding the case where parents were sentenced to 2 years in jail for neglect by omission of their five children. I have included my interview for those who missed it. It is a very interesting case and I’d very much like to know your professional opinions.